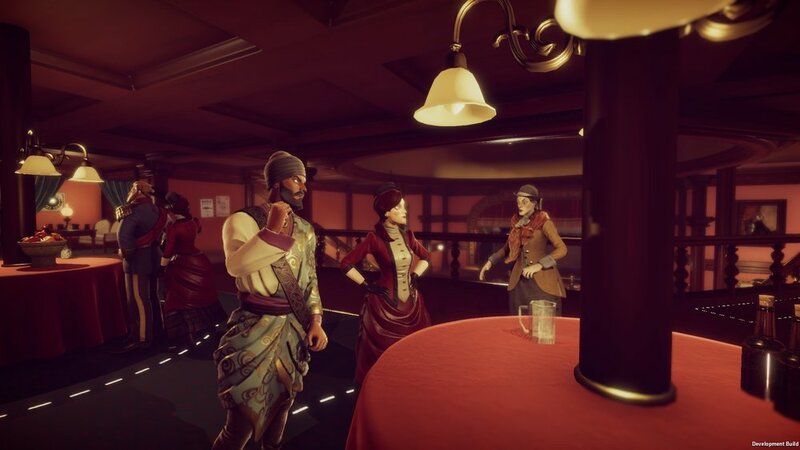 Murderous Pursuits’ closed beta provided a good look at the addicting style of the gameplay, but the beta is poorly thought out for the genre of the title. Murderous Pursuits is incredibly fun. The concept revolves around eight players trying to eliminate each other as stylishly as possible. The world is littered with NPCs that resemble players, making it more difficult to discern who the target is. Hunters don’t get an image of their quarry—the player they are hunting—and instead have a tracker which alerts them when their target is nearby. Quarries are also notified when their hunter is nearby, quickly creating tense situations. However, if a hunter tries to assassinate their quarry in the presence of a guard, they will be arrested and assigned a new target. Favour—the scoring system—is determined by how successful the player’s assassinations are. For example, depending on which weapon is used to eliminate a target, more or less favour will be earned. These weapons can be found in boxes around the map, but the player requires some favour to pick them up, making it impossible to get a high favour weapon before a hunter’s first kill. Additionally, players have to blend into environments to decrease suspicion, and if this is done successfully, they get more favour. Murderous Pursuits also allows players to choose from two of five abilities, and some of these can provide more favour as well. For example, if the player assassinates their quarry, they can taunt over their corpse, allowing them to gain a bit more favour. These immersive mechanics force the player to keep their guard up at all times. While desperately searching for their target, they have to make sure they don’t get killed. Things get especially tense when the player knows who their hunter is and has to either run away or find a way to deceive them. Not only that, but if the two players spot each other in the presence of a guard, a game of wits is sure to follow. However, a lot of this tension is hard to appreciate with a lack of players, so hopefully the game acquires many once it launches. Murderous Pursuits’ visuals help its immersion, providing a charming iteration of the Victorian style. Characters are designed in a bizarre yet familiar way, reminiscent of BioShock or Dishonored. The narrator helps the game feel more Victorian with his funny bits of dialogue and thick accent. The levels are all the perfect size for hunting, and there’s not much confusion with how many floors there are or which rooms lead where. Each stage is designed for a perfect game of cat and mouse. An annoying aspect of hunting is that if you’ve identified your quarry and they’ve identified you, it becomes a clicking war to see who wins first. In one of the matches I participated in, there was a player who always had priority over everyone else in the match. They never died once, likely because they were so quick at clicking the left mouse button. It would be nice if there were visual clarification during the battle, as the player seems to lose out of nowhere. The overwhelming issue of the closed beta is that it was incredibly barren. This isn’t an issue with the game being unpopular; it’s simply a fault in the way codes were distributed. For a 1-8 player game to be lacking in players goes against its premise. Throughout my experience, there have only been three other people in a match with me at a given time. The rest of the slots are filled with bots, and though they’re coded well, it’s not nearly as entertaining as going against actual players. Murderous Pursuits has the potential to be an incredibly fun stealth-em-up akin to The Ship. With its great game mechanics, the title just needs a lot more players.